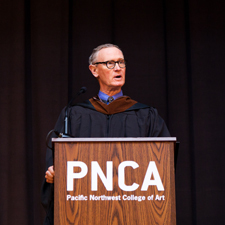 It is an honor and pleasure to speak to you all today at Pacific Northwest College of Art. You are so fortunate to live and work in this community. Portland is an extraordinary city – no, it is a state of mind – that, with its heritage of beauty and civility, continues to inspire generations of creative people. Nurturing both right and left parts of your brains, Portland is the perfect location for a school as stimulating as PNCA. This jewel of a city is filled with cultural institutions and people that show what can be accomplished with the wit and resources to make positive differences in the lives of the citizens here. And at PNCA, you are lucky to have a great Board, President, and faculty, whose big ideas make sense in this intimate college. I want to congratulate Tom Manley, who this year is celebrating his 10th anniversary as your President. During his time at PNCA, the College’s community has together made many improvements of the College both programmatically and spatially. Community service has been one of PNCA’s passions, through which many of you have contributed to the education, design functionality, and environmental sustainability of the region. 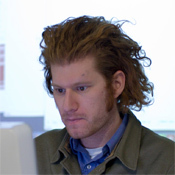 C4D is a great example to other design schools of ways PNCA has helped to improve the region’s social and economic viability while giving students a chance to engage with clients in design services. My talk today – “What did you say?” – is about making a difference in your own life, in the local community in which you live, and in the world at large. How is that possible? How can artists and designers help shape the future? Make people’s lives better today? I want to describe the attributes of a creative life, how they can be applied, and give you some encouragement to get involved with the important issues of your time. Here it goes – the “Commencement Address.” I can see some of you now rolling your eyes, whispering to each other. I understand that commencement addresses are among the most forgotten lectures ever given. Right now, thousands – millions – of speakers’ words are echoing in the back of auditoria or college quadrangles. Their remarks are shouted over the heads of euphoric graduates and their relatives and friends who can’t wait for the ceremony to end so that they can give each other congratulatory hugs. At the last word of these addresses, after polite applause, the President will rise to award the degrees. Finally “it” is over. Commencement speakers’ words die with the often-repeated ideas they have represented. “This is not the end, it is just the beginning,” etc. etc. etc. Cliché after cliché rattle forth. “What did you say?” will be among the questions I may get following my address here today. I do remember my own Commencement at Williams College; that is, I recall who spoke. Not what he said, but who he was. Our speaker was Robert McNamara, then Secretary of Defense, during the Vietnam War. His platitudes, whatever they were, were willfully ignored by my classmates, many of whom stood up and turned their backs to his words in protest. They were not protesting his remarks, but protesting his role in directing a needless war. Many of my graduating class never returned from the war in Vietnam that Robert McNamara managed. And I painfully recall also the thousands of Vietnamese and Cambodians who perished in napalm attacks on burned villages and rice patties during that war. Now fifty years later, I see pictures in my alumni magazine of smiling college classmates sitting in cafes in Saigon as tourists, admiring the rich gentle friendly culture that has welcomed Americans back to their shattered land after we nearly destroyed it. Robert McNamara, now gone to his own reward, apologized in his later years for his role in stoking the war. “It was wrong, terribly wrong,” he said. The artists and designers whose art protested that war, just like those whose work has been protesting the wars in Iraq, Afghanistan, the conditions at Guantanamo prison, and similar matters today, help to remind others of their responsibilities to act in humane ways. My point in sharing with you this bitter reverie, is to exemplify that what you do counts for more than what you say. In your own time, issues of world politics have become even more complicated and difficult than ever. Gun control, illegal wars and terrorism, gay marriage, the economy, immigration, racial politics, and the environment confront you now. What will be the issues you will face in the years to come? And what will you do about them? Of what value is your own voice as an artist or designer? But every time you see these words, “if you see something, say something,” think about them in relationship to your roles as artists and designers – and as citizens of the world. In what you make and what you do, “if you see something, say something!” To put it another way, “if you see something, make something.” Have something to say through your work. This is the theme of my talk today. As artists and designers we have a role in these goals. We can speak through our art. We can take lessons from our education and apply them in taking actions that help achieve Sach’s goals. And by speaking out we can assuage our own consciences as we become our generation’s witnesses to the tough issues of our day. Can we be quiet about the workers’ tragedy in Bangladesh, and design clothing that we know will be made in unsafe factory conditions? Can we paint landscapes of our magnificent coastlines and mountains, while these views are threatened by human interventions? Can we turn our backs on prejudice against people of other cultures than our own, while incorporating the power and charm of their art in ours? If we see something, we must say something in our lives and in our work. 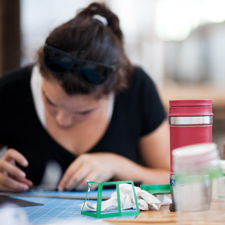 In your education at PNCA you have been taught to see; and to see differently from others. You also have been taught to think differently. Or your natural tendency to think differently has been enhanced at PNCA. You have been applying your distinct thought processes to making things; solving visual problems. Many of these visual problems have been what I call “self referential,” in that they are about the process of making art. These are issues of composition, materials, texture, form, and function. You also have been exposed to history, literature, architecture, and scientific subjects that you’ve been challenged to integrate into your thinking. Being worldly means being informed. It is easy as an artist or designer to become so absorbed in your own work that the rest of the world becomes distant and irrelevant to it. And to you. Yes, there is still a war in Afghanistan, terrorism in Boston, people living next door below the poverty line, more proof of global warming, etc. One can live on without all of these important issues impacting you directly. Yet the condition of the world affects us all; being informed can bring you to action. Frank Bruni wrote recently in The New York Times that “a clueless electorate is a corruptible one, and one that seems ill poised to make the smartest, best call…” Art that isn’t connected to urgent issues can be corrupted into slickness; art that isn’t backed by fact can become propaganda. You probably have been encouraged at PNCA to inform yourself, and to become involved in issues of social change and community improvement, either on campus or in the environs of Portland. PNCA’s program in which some of you have participated, called the Applied Craft and Design program, attempts to motivate student entrepreneurs for change. Maybe this commitment to action is generational; more likely the need for artists and designers to use their talents and skills to help improve our society is very necessary now. Some schools are even calling their programs Design for Social Change, and teaching students “social entrepreneurship.” YoYo Ma’s Silk Road Project and Harvard University have just created fellowships to activate cultural entrepreneurs that will improve their social environment. Why are art colleges pushing their students out of the studio into the “real world” to become social activists? Because you, like students in all art schools, have been trained to observe, process, and react in uniquely creative ways. By thinking “outside the box” you can add perspectives that are divergent from traditional means of solving community and world problems. Although your talents are useful to make art and design, they also could be applied to other aspects of life. 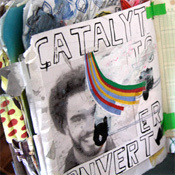 Creative resolutions to business, social, and environmental concerns are your gift and your opportunity. You may lack the answers to the important questions about which you are speaking through your art. If you only state these questions clearly in your work however, you may have already made an important contribution to society. Or your actions themselves could suggest new pathways toward answers to society’s problems. So much of the issues about which we ought to care seem so large that traditional organizations seem unable to cope, incapable of deciding what to do. So many people in institutions, government, and business seem locked into ways of seeing and doing things that simply don’t work any more. Our national government now seems frozen. Legislators are locked in endless struggles without resolution while people with great need wait for action. Some politicians seem more interested in their own reelection than in serving the people who voted them into office. Some business leaders seem more interested in their own personal gain than in helping equalize opportunity for others. The haves seem to have pulled up the ladders, leaving those on the lower rungs without the resources to move upward toward success. As artists and designers, you can bring fresh perspectives through your work that will motivate people to act on others’ behalf. In this climate of so much need, artists and designers have so much to offer. Yet there has always been the tension between art that pleases and art that challenges. Daniel Levy-Strauss has written, “…debates about the social utility of art generally break down into the age-old argument between the essential and the contingent: [between] being and doing. Art of the highest order just is. If [art] is expected to do something, it can only do so in a debased form and at the expense of its true nature. The clearest statement about this dilemma that I know shifts the argument just slightly, to the relation between doing and making. In De Monarchia, Dante says that “there are things to be done which are regulated by political wisdom, and things to be made, which are regulated by art.” Dante goes on, “This is not so much a conflict as a collaboration, since both realms are ‘handmaidens of speculation, as the supreme function for which the Prime Excellence brought the human race into being.’” Hannah Arendt said at an earlier juncture, ‘The conflict between politics and art…cannot and must not be solved.”’ This tension is for the good of humanity! Every little bit does count. Your own artwork needs to carry messages of meaning as does your life – which will come from your work. Infuse your works of art with statements that teach, inspire, and motivate people to be concerned with the plight of others. Get involved with political movements – bring awareness to our two political parties of the issues of the day through your own artistic expression. Take to the streets, using yourselves as an example of what concern can mean as living forms of art. Live your lives as though they count as art; make your actions into art that carries meaning for others. Acts of citizenship can be expressed as art. I am not suggesting that the only good art is political. A lovely landscape painting, a beautiful ceramic dish, a handsome layout of a new book: all these are a bulwark against incivility, and bring pleasure to many people. These works of art do say something that helps to remind us of the universal quest for humanity, peace, and harmony. If you are inspired by beauty, make something beautiful. So I come back to the slogan: “If you see something say something.” By now I hope you will realize why you should remember this statement, and what you can do about it. If you see inequities among peoples, if you see intolerance and prejudice, if you see environmental degradation, you have an obligation as an artist to say something about it – either in your art, or in your actions. Be a force for change; make something happen. Manifest in your art and in your life the positive values of the arts themselves – openness, clarity, purity, breadth of understanding – and care.